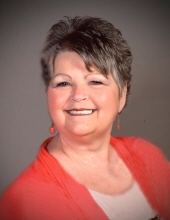 Linda Kay Samons, age 58 of Martin, Kentucky, passed away on Monday, March 25, 2019 at UK Medical Center, Lexington, Kentucky. She was born December 23, 1960 in Martin, Kentucky to the late Elmer & Cuba Conn Crum. She was the wife Randall Keith Samons. She was a retired billing clerk and member of Prestonsburg Church of Christ. Along with her husband she is survived by her Son: Michael Keith (Jessica) Samons of Martin, Kentucky; Daughter: Jennifer Lynn Samons (Kevin) Allen of Martin, Kentucky; Grandchildren: Briah Natalie Samons, Gauge Keith Samons, Jenna Rose Allen & the late Kalyn Faith Allen; Brothers: Steve Conn & Tommy Crum both of Martin, Kentucky. Along with parents she was preceded in death by her Brothers: Kenneth Ray Crum & Elmer David Crum. She will be missed by all that knew and loved her. "Email Address" would like to share the life celebration of Linda Kay Samons. Click on the "link" to go to share a favorite memory or leave a condolence message for the family.